In total, about 300 specialist companies contribute their capabilities to global aerospace through the Midlands supply chain, working in a business environment that fosters the highest levels of innovation. The aerospace industry's supply chain roots extend deep into the Midlands world-renowned advanced engineering economy for electromechanical, hydraulic, pneumatic, electronic and electrical components. A cluster of specialist technology suppliers processes advanced aerospace metals and composite parts and materials. Discover the capabilities of Midlands aerospace companies online here or by downloading the pdf document here. 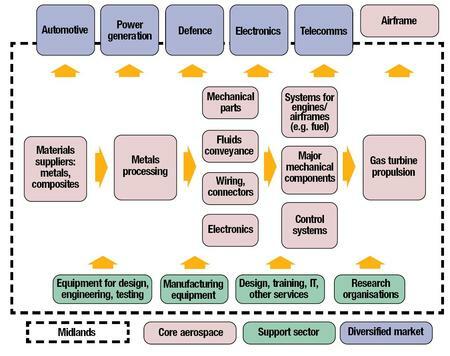 The diagram below portrays the key elements of the Midlands aerospace supply chain as a cluster, starting from raw materials production (left) and ending with aero engine production (right). Supporting institutions are depicted below and market sectors above.